Luxury detached cottage with outdoor jacuzzi hot tub. Seabank Lodge is a stylish contemporary building in a spectacular location. It has four bedrooms and can comfortably accommodate 8 people. Beautiful oak floors and large leather sofas in the lounge. Oak bedroom furniture. Goose Down Duvets. Short breaks available in low season. Also at Seabank we are adding Seabank house to our portfolio for holiday rentals. Seabank House Sleeps 10 with hot tub, so please get in touch if this is of interest. Built in 2008, Seabank Lodge is a new architect designed house with stunning views over Loch Creran. 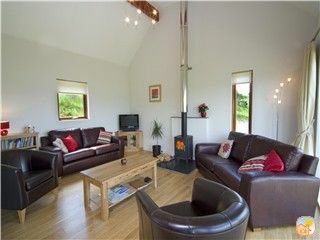 The detached cottage is very light with floor to ceiling windows in the lounge and dining area. On the ground floor there is a double bedroom with en-suite wet room, a twin bedroom and public bathroom with shower. There is a fully equipped kitchen with gas hob, electric fan oven, grill, microwave and dishwasher. There is a separate utility room with automatic washing machine, tumble dryer and freezer. The Large lounge and dining area has the most wonderful view with floor to ceiling windows. There is a wood burning stove and under floor heating throughout the ground floor. Satellite TV, DVD , Radio and Cd Player. The lounge has a vaulted ceiling and luxurious leather sofas. Books and Games as well as information about the area is provided. The Lodge has Wi-Fi Broadband internet access. Upstairs there are two bedrooms; a twin bedroom, a king size bedroom with en-suite shower room. All the bedrooms have a fabulous view over Loch Creran. There is gas central heating and solar panels to heat the water. Seabank Lodge is suitable for disabled guests with level access from the car park. You will be welcomed personally by the owner. We have been welcoming guests to Seabank for 10 years and enjoy getting to know the many holiday makers who return year after year. Our local knowledge is not bad as we grew up in Argyll and love to get out and about walking, visiting the islands, cycling and eating out! We designed Seabank Lodge to make the most of the amazing location and the views up Loch Creran. The floor to ceiling glass allows you to enjoy the scenery without getting off the sofa! The hot tub has been a big attraction too. This is the kind of house I would stay in with my family if I wanted to be comfortable, relaxed and in the perfect place for doing as much or as little as I wanted to!! Wheel in entry wet room suitable for disabled. Wheel in wet room en-suite to double bedroom. Situated near the small village of Benderloch, 9 miles north of Oban in the scenic West Highlands of Scotland. Magnificent views of Loch Creran and the mountains. The islands of Iona and Staffa can be visited on a wonderful day trip. Iona Abbey and the ruined Nunnery are very interesting and Fingal's Cave on Staffa is magnificent. May and June are great months to see all the puffins and many other nesting seabirds. Glencoe is also nearby which has dramatic scenery and wonderful walks. Climbing and hill walking in this area is fabulous. The island of Mull makes another great day out. Featured on recent TV wildlife programmes it is home to sea eagles and golden eagles. Marine wildlife spotting is also popular in the waters off Mull and whales, dolphins,otters and seals are seen regularly. Sea Kayaking is a great way to explore the lochs and coastline. There are local guides who can supply tuition and kayaks if you wish. There are numerous castles to explore including Dunstaffnage Castle near Oban, Duart Castle on the island of Mull and Inverary Castle. Oban has a whisky distillery and visitors centre. The local seafood is wonderful and there are fabulous restaurants in the local area. The Isle of Eriska hotel is very near to Seabank and a special occasion can be celebrated at the Michelin star restaurant. Also the Airds Hotel in Appin has AA 3 rosette restaurant. Friday- Friday weekly rentals during July and August. Short Breaks 3 nights and as late availability option. Price is fully inclusive of gas, electricity, logs for the wood burning stove. Towels and bed linen all provided. Outdoor hot tub is for your exclusive use. Wi-Fi internet access provided. Welcome pack is very generous and home baking now legendary! !